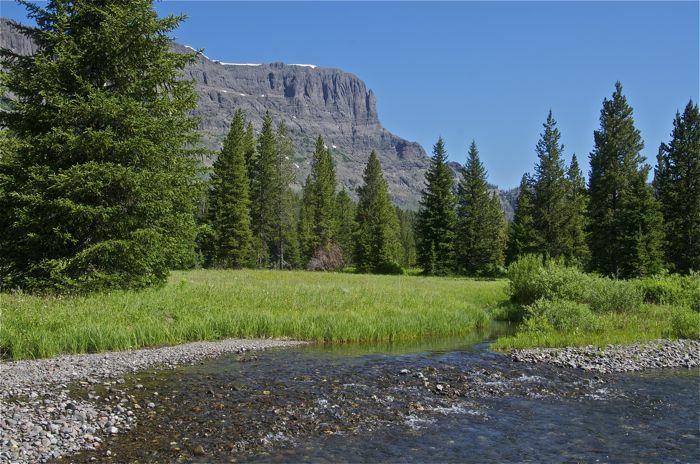 This trip in the mountainous northeast corner of Yellowstone National Park is a wonderful way to experience an absolutely beautiful high mountain and valley area on a very mellow trail with only a couple of modest ups and downs. Wolves, bear, moose, bighorn sheep, mountain goat, and more thrive here, and we almost always see large mammals. The terrain is verdant and scenic, with high peaks rising above a rich mix of woods, meadows and streams. Summer wildflowers will be blooming. This is a great trip for beginners, old farts or anyone who would enjoy exploring beautiful wilderness on a relatively easy route. We rate this trip moderately easy and its base is Gardiner, Montana. Note: Due to campsite availability, the 2019 trip is rated “moderate“, because there will be an “extra” uphill on the 4th day of the trip that most years we don’t do. If anything, this variation in the route will make the trip even more interesting than usual, and most reasonably fit folks can handle our “moderate” trips. 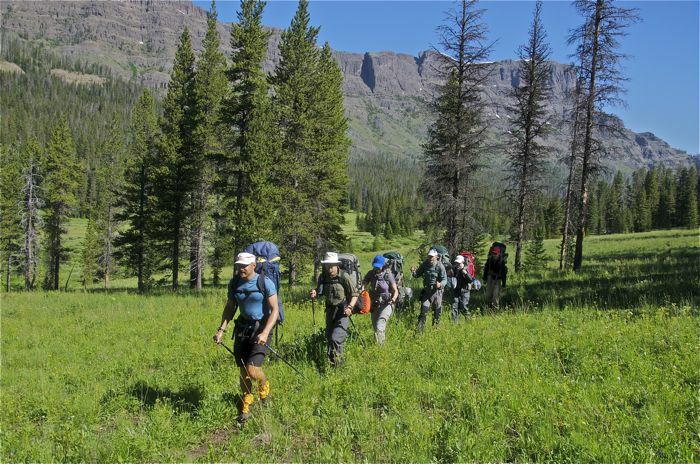 This Yellowstone backpacking trip is in the far northeast corner of Yellowstone, adjacent to the Absaroka-Beartooth Wilderness, and is mostly in a beautiful and lush high mountain stream valley. Most years we day-hike on our layover to an adjacent spectacular high mountain pass. TREK BASE: Gardiner, MT. Comfort Inn, Route 89 Gardiner MT, phone (406) 848-7536; gm.mt411@choicehotels.com. Mention that you are a Big Wild client for a 10% discount. If you need a night in Bozeman, we recommend the Bozeman Comfort Inn at 800-587-3833 or 406-587-2322. MEETING TIME: Pre-trip orientation plus food and gear handout and safety talk at 6 pm the evening prior to the first day of the trip, at the Gardiner Comfort Inn. TRANSPORTATION: Air service to Bozeman; rent vehicle for drive to Gardiner. Major rental companies available. Or, Journey Rent-A-Car is economical and will give Big Wild Clients a 10% discount if you book by phone at 406-551-2277 and mention that you are a Big Wild Client. Amazing Taxi from airport to Gardiner at 406-223-5344 is another option, though more expensive. TREK RATING: Moderately easy on good trails with very gentle gradients. Our longest backpacking day will cover about 5 miles, and we’ll have at least one layover. ELEVATIONS: 6500-8000 feet. Maximum one day elevation gain with pack is 800 feet. WEATHER: Typically lots of sun with warm days and cool nights. Afternoon thunderstorms are common, but prolonged rain is not. 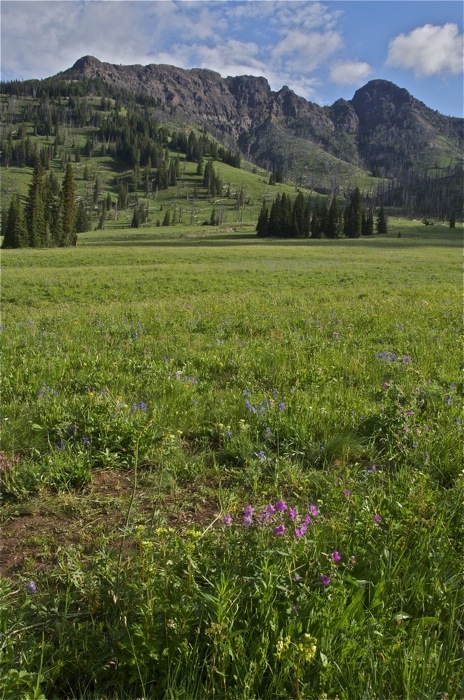 Nonetheless, in the high country, visitors must be prepared for any kind of weather, from snow to 80 degrees with hot sun. Click here for the National Weather Service forecast. FISHING: World-class trout fishing in the streams requires a permit that can be obtained when we enter the park. It is mostly catch and release. 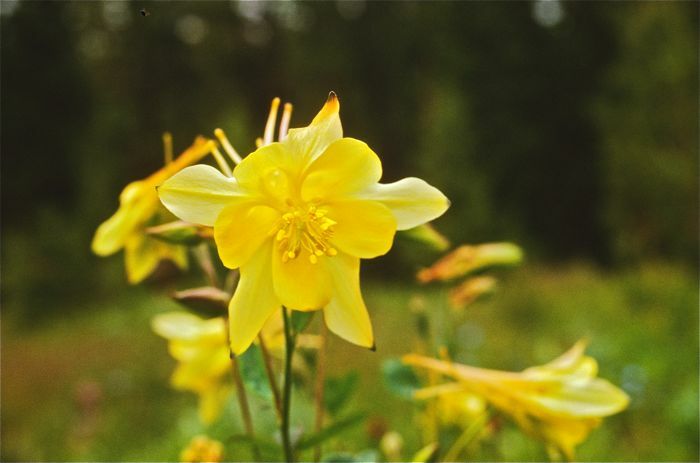 SPECIAL FEATURES: Summer wildflowers will be in bloom. Wolves were re-introduced just a few miles from our trailhead. Wolf activity varies each year and seasonal pack movements are unpredictable, but we may get lucky enough to hear or see these magnificent carnivores! There’s plenty of other native wildlife, too, including mountain goat, bighorn sheep, moose, bear and elk. 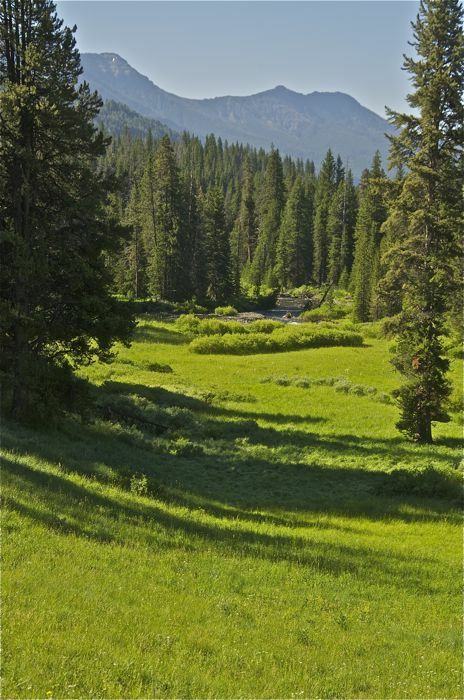 This verdant mix of forest and meadow features snow-capped peaks rising above a gorgeous mountain valley! This is a remote, little-known part of Yellowstone that is truly magnificent. SPECIAL TIPS: A lightweight set of binoculars will come in handy for wildlife viewing. This is grizzly country, so eschew deodorants and other sweet smelly substances! 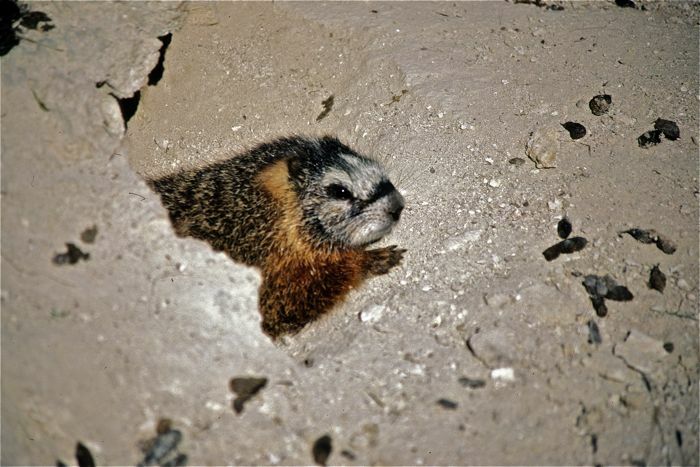 STATUS: The Yellowstone backcountry has long been proposed for Wilderness designation under the Wilderness Act of 1964, but so far Congress has failed to thus fully protect this, the world’s first national park. It is managed as de-facto wilderness. ITINERARY: This is a Yellowstone backpacking trip where we end at a different trailhead than where we begin, which is about an hour and a half drive from Gardiner. Campsites will be reserved exclusively for our group. Please Note: Because we are flexible and vary the route depending upon conditions, mileages and elevations are approximate, not exact. Read more about our other Yellowstone trips. We also offer a variety of other hiking trips in Yellowstone Park. At the links below, we’ve listed details about our Yellowstone hiking and backpacking trips plus other treks in Wyoming & Montana. 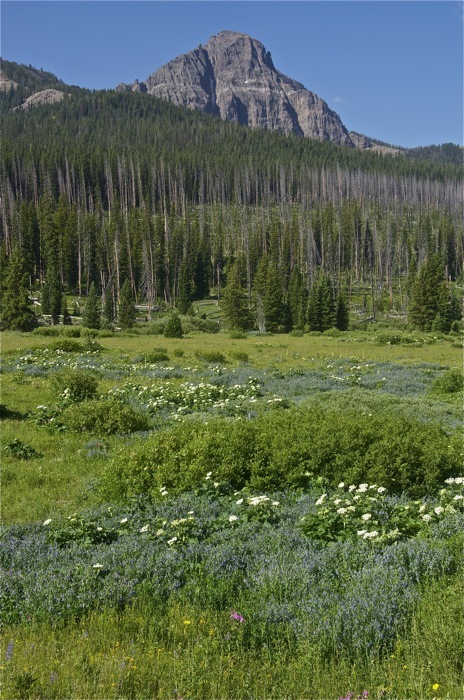 When backpacking in Yellowstone Park with us, you will be in either Wyoming, Montana or both.